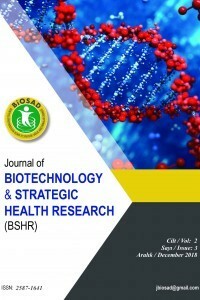 Journal of Biotechnology and Strategic Health Research(BSHR) is an open access and peer-reviewed journal, published quarterly by BIOSAD.org. Research findings must be novel and the original data must be available for review by the editors, if necessary. Studies that are preliminary, of weak originality or merely descriptive as well as negative results are not appropriate for the journal. Papers considered for publication must be unpublished works that are not under consideration for publication anywhere else, and all co-authors should have agreed to the submission. Manuscripts should be written in English/Turkish. The Editorial Board of the journal, reserves the right to accept or reject the article at any stage and any time or delete a part of the text, tables or figures, if necessary.